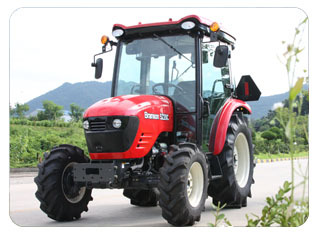 Branson tractors are manufactured in a state-of-the-art design, research, testing and manufacturing facility in South Korea. The kukje Machinery Company, LTD. Is a certified ISO 9001 company that has been manufacturing agricultural equipment since 1968. Through hundreds of local Branson Tractor dealers, our tractors are sold to individuals that find thousands of uses for our products. Since they are designed to be as simple to maintain as they are to operate, Branson tractors offer dependable quality. Branson tractors are assembled in two U.S. facilities in Georgia and California. From these assembly centers, tractors are distributed to dealers in 45 states and Canada. Also, a complete line of parts to service every line of Branson tractors is maintained and available for quick shipment. Since Branson tractors are designed to run for decades, reliable parts support is critical and we offer that support. The corporate U.S. headquarters for Branson Tractors is located in Rome, Georgia. 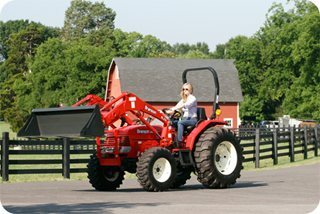 HEAVIER FRAME When comparing compact tractors, horsepower should not be the only consideration. The weight of the tractor¡¯s frame allows the horsepower of the engine to hit the ground providing power and endurance. 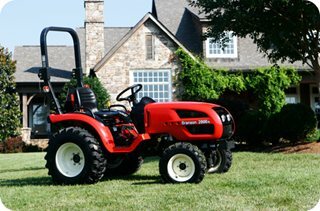 Unlike many light compact tractors on the market today, Branson Tractors are designed with heavier chassis. A lighter tractor produces excessive wheel slippage, as the wheels lack traction. .Unless expensive ballasts are added to lighter tractors, traction .cannot be improved. SMOOTH RIDE Branson Tractors with exceptionally designed engines and heavier frames offer a comfortable and smooth ride. EASY TO MAINTAINBranson Tractors are built for endurance. Quality construction of every element insures that your compact tractor will last for many years. Since many tractor owners prefer to do their own maintenance, Branson Tractors are designed to be as simple to maintain as they are to operate. Most tractor servicing can be done with common tools. The side panels attach with quick pins so they can be removed in seconds, allowing unrestricted access to the engine and other front-end components. QUICK ATTACHMENT OF IMPLEMENTS Since there are hundreds of uses for Branson Tractors, they are designed to be compatible with many implements, whether it¡¯s .pull-type three-point hitch mounted or PTO driven. Implements attach quickly and easily with the click of a lever no tools required. The very latest in design and technology is built into every Branson model and adds value to our tractors. The best news of all is that they are priced very competitively compared to similar compact tractors on the market today.